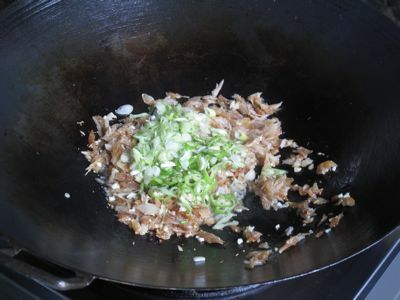 Heat up a large wok or saute pan, add some vegetable oil, then finely minced garlic and a few seconds later the shredded dried fish. Add the white parts of the scallions and the sliced chilies and saute for a few seconds more. 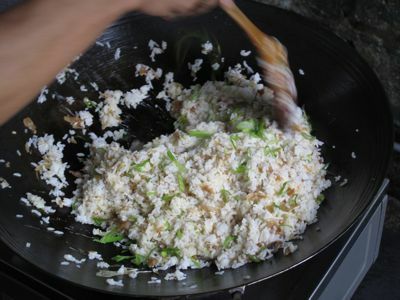 Add in the rice and mix well until the dried fish and rice are well blended. This will take a few minutes to heat up all of the rice. Then add the eggs and stir some more. Some freshly ground pepper might be nice and taste for saltiness so you can adjust with some added salt if necessary. Serve with smashed tomatoes and chili vinegar on the side and eat happily. :) Here’s a previous post on a very similar take on this dish. Nasi goreng may be more flavorful. Crab fried rice more extravagant. Chorizo fried rice more cholesterol laden. Fried Rice with Bettyq’s XO sauce is also fabulous. But Daing Fried Rice is still one of my favorite comfort foods. this is torture waking up on a sunday morning and the first thing you see is a daing fried rice ahhhh. should I get up and cook this or continue to dream about it. This looks so good. Where oh where do I get decent dried fish? Let alone fry it outside in rainy Seattle weather? What is a hungry girl to do? Just woke up. I can almost smell what your cooking from your list of ingredients. Yes, MM, nothing beats fried daing and hot choco on a Sunday morning after a storm. Where I am in Leyte, it is fried boneless danggit from Palompon, sikwate and puto maya. As an American here living in the Philippines and married to a Filipina … I can assure all Westerners that this is the second most horrid smell in the Universe! 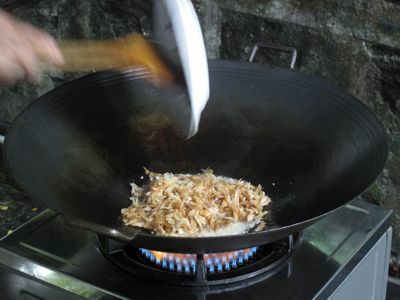 The first being, of course, bagoong frying. Ok, so I miss this for breakfast……but I just had a great lunch….ZUBUCHON!!!! James, I feel for you. Hahaha. A couple of filipinos frying dried fish in the states got them sued by the neighbors or building owners. Other residents thought something had died and was decaying in the said apartment. Hahahaha, the Blue cheese thingy hahahaha. I used to wait on table back in college and I could not understand how peoplecould eat it back then but when I got older, hmmm I actually start liking it and also start craving daing which is kinda wierd because I thought my mom was punishing us for feeding us dried fish, yeah I used to hate it. I guess mom is always (for most of the times) right hehehehehe . I eat almost 100% native food when I go back home, from native chicken tinola to daing na bangus, all the brothy soup dishes and definitely NO American fastfood, not even the pasosyal pasta. Pics look good. Nasi Goreng with eggs and bilis (or dilis for us). Available @ Mustafa Center/Mall in Little India, Singapore, 24 hours.. eat kamayan style, wow!!! I love daing fried rice. I know foreigners doesn’t like the smell of it but it brings a lot of flavor to the dish. I think they’re missing a lot. I baked dried danggit wrapped tightly in aluminium foil in the toaster oven. I had to put a slice of lime on the foil to mask the little bit of stink that escaped from the foil. I had to open it on the balcony and, even then, the kitchen still smelled. It was a big production number but well worth it. I haven’t had fried danggit in almost 10 years. So, go ahead MM, don’t worry about your Aussie neighbour. Fry those dried fish everyday for all of us who must not offend our neighbours in our adopted countries. sarap. one of my favorite chinese food fried rice is salty fish fried rice. I can just eat the rice by itself without any main course meal. Forget about the aussies next door, just enjoy the good rice breakfast. Comfort food gets to us all at the same time? Or I am at that age when it hits me all the time? :) Kanin Club has this and whenever there is an urge for home cooking, we hie off there. when you have meals with fried fish and rice..the diet plan goes over the wall. 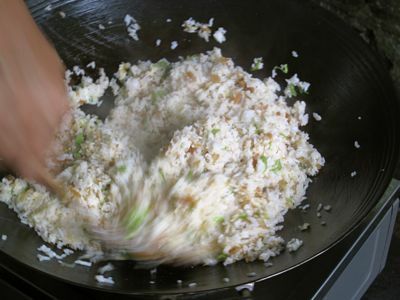 Marosee: my MIL makes this salty fish fried rice for my youngest son. She buys from Chinatown this really stinking dried fish that looks like “espada”. Then she steams it first with slices of ginger (she puts ginger in everything!). Then shreds it. 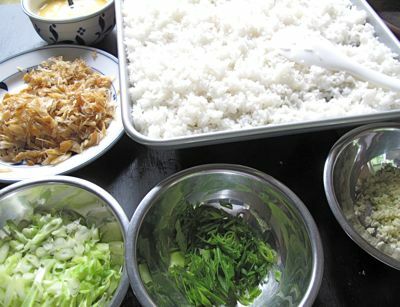 …proceeds to make fried rice…the only thing that she does differsntly from MM’s recipe …really hot wok and smoking hot oil and rice…stir fry …then create a well in the center….adds the egg, green onions…the fish together ….stir fry a bit and mixes together with the rice. from where I am now.. I am dying for a daing. And I am not in Great Britain… we are just using their bloody servers… No not the food servers but the Internet thingy server stuff gizmo. Bacalao- can be a decent substitute, if im not mistaken..peace..
Salted fish is full of umami goodness, makes dishes so much better. I add some bagoong or patis to a basic tomato sauce and it sort of just creates a different subtext of flavor. My only problem is I don’t like waiting when cooking with salted fish. All the soaking, the shredding, argh! I’ve turned to using Connie’s bottled daing na isda in olive oil when I really need that hit of fishy saltiness in my garlic rice. I had a great meal on duty that day!!! Sarap! 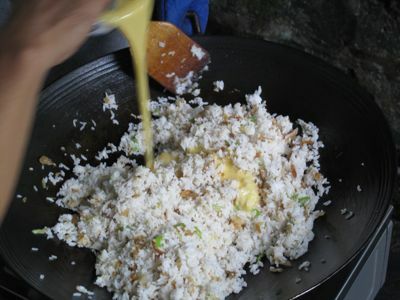 Daing/tuyo is another dish that tastes better when eaten with hands. Earlier this week, while visiting evacuation centres, I automatically salivated at the smell of evacuees cooking tuyo. Although their living conditions were beyond pathetic, I actually envied them their lunch. One time, i cooked tuyo outside , it was early , i thought most of my neighbors should be at work, so di gaanong nakakahiya. I guess the stench was so bad the dogs in the neighborhood started HOWLING!!! I was so scared that the police will knock on my door and say “Mam, there’s a report that there’s an awful smell coming from your backyard” Thank God ! it didn’t happen, but from thereon I never cooked tuyo again! kakainggit ka naman! yummy! i do something similar here but improvise using bottled tuyo fillets and frying the eggs, scallions etc before adding the rice. Oh, I miss daing and tuyo so bad. I couldn’t cook it at home since it stinks up the whole house and lingers for days. I tried cooking it in the microwave but it still smells. I can’t cook it outside because the neighbours might call the cops too. Someday I’ll have my Daing Fried Rice again. For now I’ll just have to stare at your pictures while eating my Kraft dinner. I think there is actually a lot in common between Asian dried/salted fish and things like salted anchovies (which many Americans don’t like). I like them both as well as things like Portuguese/Spanish salt cod (bacalao) and Asian fish sauces. But the odour is definitely an acquired tolerance!!! MM and Mila: you know what else is REALlY, REALLY GOOD?? …flame broiled hamburgers made with PATIS! (which I think is one of the secret ingredients to Vera’s or In N Out Burgers). Eons ago, we lived close to Tropical Hut. So, that is the hamburger I grew up with and replicated here at home for several decades and also became household hamburgers that I fed my boys and their friends for several years. Vera’s burger went into town and the boys then turned their noses to Tropical Hut haMBURGERS. I have eaten quite a bit of Vera’s burgers now that I think there is Patis or something closely related to Patis. My Vietnamese friend who owns a restaurant shared this ingredient with me. She told me to use Maggi seasoning in the Vietnamese sandwiches and Patis in hamburgers. Once in a while, the boys will have a hankering for Tropical Hut hamburgers but Patis Hamburgers is the hamburger of choice now! Little do they know, that what I did was just omit the salt in the Tropical Hut ones and replace it with PATIS! I always order this dish everytime I go to this Malaysian/Chinese resto and it’s exactly like yours with the inclusion of shredded iceberg lettuce and beansprouts.Yummy! Hmmm. I’m lucky in this respect. My Caucasian husband and 16 year old daughter love buwad. True, they don’t like the smell when I’m cooking buwad, but when it’s done…boy, how they could eat them dunked in Data Puti vinegar paired with garlic fried rice, but then my husband is an adventurous eater. yummy… dont have my own kitchen again, darn. Anyway on my transit at Heathrow Termina 5 I took the comfort of having kedgeree for breakfast. That was the closest I could have to Fried Rice. Yum! Uncommon subject. 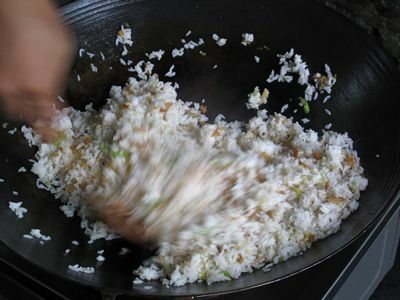 Not too many food articles/shows that I know of focus on fried rice as the subject. Much less fried rice with daing. Good one! @BettyQ, i will try that patis on burger patties. I soooooo soooo loved Tropical Hut hamburgers back then. I remember saving my school allowance just to get a taste of their hamburgers once a week. I still miss it, since i haven’t had it in ages. bettyq…my dad is from malabon so we put patis on everything! and yes it is good with burger patties! denise: that is why the raw burger mounds are called patties… from patis. My partner, He’s British, he hates the smell of tuyo being cooked, so we only do it when he’s out of the house, but I mean even the maids doesn’t like the smell of Kippers, it’s too fishy…..